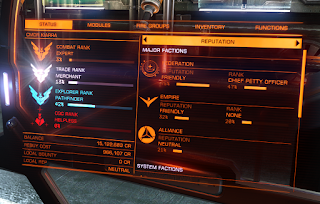 Elite Dangerous Exploration Diary: Here we go again! Had a bit of a break catching up in the forums, lots of phone calls with personal stuff, but looking forwards to rebooting this exploration project. In case you didn't see the update to the last post, which I didn't re-share, (I don't like spamming folks with unnecessary updates), here is the link. Also, I have published the route that I originally took in a table showing some basic data. Link to original route. The two following pictures are of my progress at this current point. 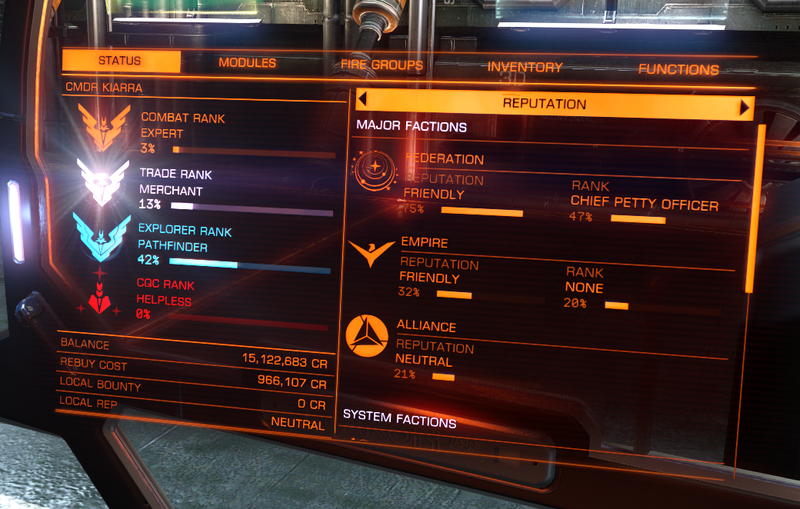 It is more of a reference for myself, but as you can see, I am not the most experienced pilot in the galaxy! 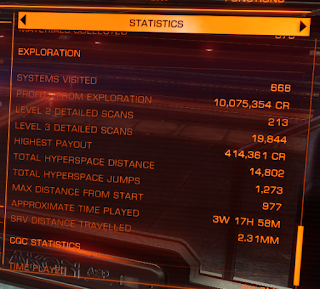 Being a casual player means that if I do log on, I may only spend an hour online. Sometimes more, sometimes less. 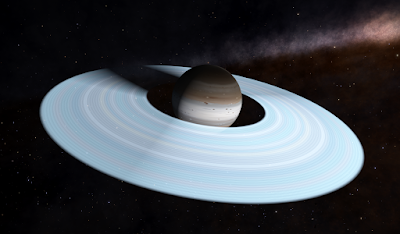 My new route from the bubble, is a little different from the original, This time I am travelling towards the mid to lower part of the arm of the spiral in which we live; thus taking in some of the Synuefai field of systems. This field has had a lot more systems previously discovered and seems to confirm one comment in the forums that many folks travel along the bottom of the spiral arm. One tip that will help you, and perhaps something that you already know, is turning off modules that are not necessary. AFM, Docking Computer, Shield Boosters, etc. This has the effect of reducing your fuel consumption whilst travelling around in cruise and scanning the planets. I have reduced my fuel/hour by 0.4, which may not sound much, but over a long time is quite considerable. 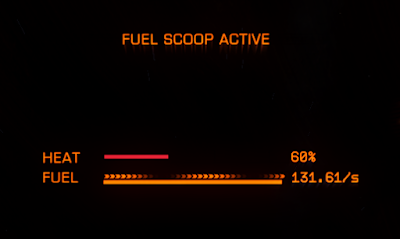 Also, this reduces the amount of heat so your ship is running cooler. The advantage of this is when fuel scooping, as you will be able to scoop faster at lower at lower heat levels. Normally when scooping at 130/s my heat was around 65%, so a reduction of 5% makes it a lot safer. If you prefer to scoop at high temperatures, then this will allow you to scoop faster and make full use of fuel scoop. I have made a little progress to my first way point, so this is the current data for 2 sessions. 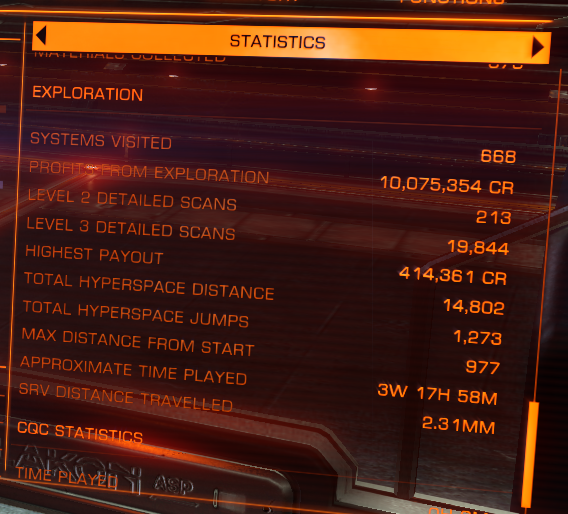 Much faster travelling as on this route, many more systems have been previously discovered. The Synuefai field is not what I would call exciting, So not may pictures from this session. 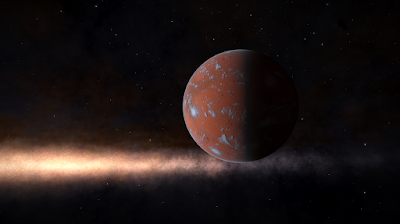 A high metal content content world with an atmosphere.Very pretty.